For nearly three quarters of a century, IKEA has been spreading out around the globe to become the world’s largest home furnishings provider. 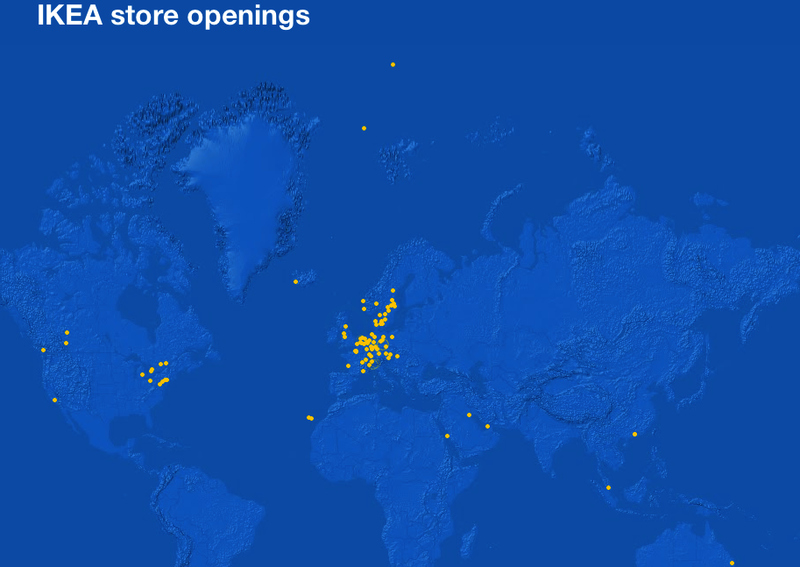 Now you can watch the hundreds of IKEA locations rain down upon the map in the order in which they were opened. Inspired in part by this FlowingData animation of Walmart expansion, Canadian designer Mike Barker has created an animated history of IKEA’s expansion, which is unfortunately not yet embeddable, but which you can watch on his site. There are worse ways to spend your lunch time than to watch how IKEA brought its products and their mostly meaningless names to the world.